This interview appeared in the March/April 2015 issue of Dimensions magazine. One of only 24 humans that have flown to the moon, Fred Haise, who served as the lunar module pilot on Apollo 13, knows a thing or two about how to steer a (rocket) ship. 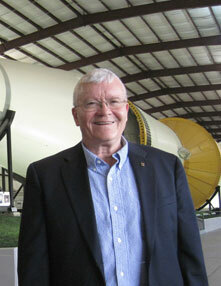 After storied careers in the military, NASA, and the business world, Haise has retired—yet he continues to lend his leadership abilities to ASTC member INFINITY Science Center, Pearlington, Mississippi, to which he drives six hours each way once a month to serve as vice chair of the board. Haise spoke with Dimensions about how his astronomical past serves him and the science center today.